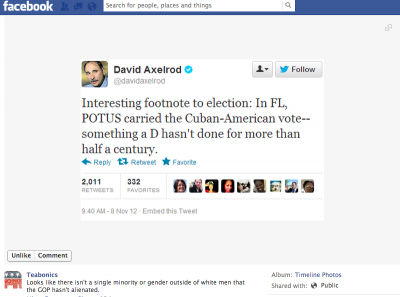 Click the image to read the conversation, with comments by Cuban-Americans, too. It is no easy thing to reject the heart of what one’s own family, and people, preaches. But, it appears that, at the risk of being called communist, socialist, estúpido and comemierda, an historic percentage of my generation, combined with newer Cuban arrivals to the U.S., voted in a way that had Abuelos spinning in their graves. The wheels have come off: 48% of Cuban-Americans in Florida voted for the Democratic President. An historic record. Compare it to the 35% Obama got in 2008 and 25% Al Gore got in 2000. “Exit polls of the Cuban-American community in Florida showed a split between Cuban-Americans who were born in Cuba and those born in the United States. Historically, Cuban-American voters have heavily favored the Republican Party since the failed Bay of Pigs invasion in 1961. That 60-40 margin would be my kind, those of us born here to immigrant and exiled families — not the ones who are recently arrived and considered by hard-line Cubans to be medio socialista, anyway. The shift is a huge, historic one for the Cuban-American community that sends a blaring message to the GOP, and our own people. So, what does this all mean? Surely, not that the majority of the American-born Cuban kids are communists and socialists. To me, it means the old conversation is just that: Old. As the children of exiles, we care deeply about Cuba and we want the downfall of dictatorship and we want freedom for our family’s beloved island and its 11 million souls. We want the magic and glory of a place our grandparents mourned and longed for finally, and forever, democratically restored. Healed. Pero, the hard-line screaming hasn’t worked. Give me something else to try. My generation of voters also is born and raised American — some of us even live outside the Magic Bubble that is Miami — and we vote on issues that affect our daily lives. We are concerned about the cost of healthcare, the frightening state of the economy and we certainly desire a rational bipartisan conversation about job and wealth creation. But, we also vote to crush the people who say wretched things about our people and culture, who aim to retard women’s rights, demonise gay friends and relatives and disenfranchise the neediest among us. So anyway, have you seen the news stories on Republicans and the conservative talking head who just after the election said hey, hey, hey wait, we do need immigration reform! All this suddenly, after 70% of Latinos turned their backs, they’re willing to talk. Whiplash. I can hear it now: ¡Qué equivocada! Pero, whatever. Want the majority of the Cuban-American kids back? Disavow extremist haters and condemn the language of exclusivity or become a political party increasingly irrelevant to once-sure bets who aren’t committed to voting like Mami and Papi. If not, not even Marco Rubio will save you. My thoughts, too, Carrie. This is a brave, intelligent post. Chantel, Brave is the Word! It was not easy to hit Publish. This is a wonderful post and echoed my thoughts exactly. will tweet out. Hopefully, you won’t get as much push-back as I have — ja! ja! No, en serio, there are a lot of us and I am glad we are no longer invisible. Thanks, Elisa…interesting that so many feel they must be closeted or invisible for having an opinion, something Cubans never are short on. My sentiments exactly, thanks for putting it out there. The “Magic Bubble that is Miami”, I love that. Lola, thank you. Are you Cuban? Yes. Well, as in Cuban that happened to be born and raised in Miami to Cuban parents. I’m so glad I found your blog! Having lived most of my adult life outside of “the bubble”, it’s nice to relate to someone else who lives in two cultures. Thank you. Very well done, Carrie. Not only is our community evolving via American-born Cubans, but we are all seeing evidence of it through media and voting results. For me, it is particularly painful to a) have to deal with the political tension within my own family but also B) have to contend with perpetuated stereotypes about Cubans by the Latino community at large. We have much work to do. Having the courage to speak up — like you did in this post — takes us a step in that direction. Midy, the tension, the tension…the judging, the name-calling. Carajo. I spoke to a woman the other day — Cuban from Miami who was visiting Nashville — who told me a relative of hers was crying and crying because the woman voted for Obama and just how could she do that? Gracias for hanging here with me. I don’t know if enlighten, but I did hear it caused a fight in Hialeah. I am just glad to offer an opinion al fin. It was hard to stay silent this election. Gracias! At last some nuance in the Cuban-American community! As an over 55yo Cuban Americana I have been waiting for this moment for years. Cuban passion can have nuance and it has to see itself as part if the larger Latino community, something the generation before me and some of my gen have had a hard time going. You give me hope! Sonia, I very much appreciate your support. Kind of sad that we are encouraged to give our opinion and enjoy a good discussion, but squashed if it is one different from the bloc? Very well said. Hang tough because some of you are already changing my generation’s mind. For your information, I am an anomaly. I am a Cuban born woman who is a Democrat and an officer of my party but nobody had to convince me. My wife and I are Cubans and we do live in the boonies. We live in the woods of north-central Florida, half hour north of Branford, the closest town to us. We grow our own food and homeschool our daughter. We live off the land, no steady jobs (pero sin cupones), no medical insurance (pero con la bendición de nuestro Dios), nothing from the government but we are doing just fine, thanks only to our Father in heaven. You cannot fool us, we are Americans too. We know very well what happened in Cuba, we grew up there until we were in our twenties. Then we came to this blessed land, we have achieved the true American dream: to own your future with the sweat of today’s work. We know very well what’s happening in South Florida, we spent 20 years living there, in Miami. You cannot fool us, we know why most Cubans that came in the 60’s think the way they do, we know what many Cubans that came in 1980 think and we know why many Cubans that came later or were born here don’t have the vision and understanding of older generations, like you. Our son was 9 years old when he came with us to America. Our daughter was born here 15 years ago, they share our understanding because we gave them all, and I repeat, all the information and they were able to see the truth, by themselves. You either never had that advantage and that’s the reason you are blind or you are a tool of those with an agenda to destroy this country. You cannot fool us, we know what happened in these two last elections. When people think that the American dream is made of stuff, they can be bought. When people find that the American dream is to own your future, they work hard for it and nobody will be able to turn them into slaves, like them and you already are. The worst slavery is not the kind that imprisons your body and uses your strength, it’s the one that controls your mind and make you a zombie, even when you think you have your own understanding and are doing your own things, but the reality will hit you hard the day you realize you are just an useful idiot, a house slave in the modern plantation that this country is turning into, just because those comprometidos a cambiarlo and their agents have sold their souls, and their future. I would love to talk to you, I would love, if there is still an opportunity, to give you the information you don’t have, or are trying to avoid because you are afraid. You see, there are only two sources of motivation in this world: Love and Fear. You still don’t know the information that will make Love the drive of your life, y yo no tengo una bola de cristal; what you write shows just that. Maybe there’s still a chance, I pray. You have my e-mail. I don’t want to offend you or upset you up. Forgive me please, if something I wrote did that, when you want to awake somebody a little shaking and shouting is required sometimes. I felt compelled to write you, that’s a sign there’s something in you or your writing that attracted me or interested me. The reason for my letter is not to insultarte. Writing to you this note is my way to extend my hand to you, with a smile, and to say: Nice to meet you, we are bilingual in the boonies too! I would like to be your friend! Burt Checa, an old cabinetmaker turned into a farmer.